Xi’an is more than just a stopover to visit the Terracotta Warriors and Horses; it is an amazing city, rich in culture and seeped in history. Located in Shaanxi Province in northwest China, it is the oldest Chinese capital and home to 13 successive dynasties. There are 72 known Imperial tombs around Xi’an - including the tomb of the First Emperor Qin Shi Haung- still to be unearthed when technology can insure a safe and effective means of excavation. This makes Xi’an a contender for the greatest number of royal tombs secreted underground in competition with the west bank of the Nile at Giza in Egypt. But that is in the future... right now it is a perfect base for exploring a World of Wonder. 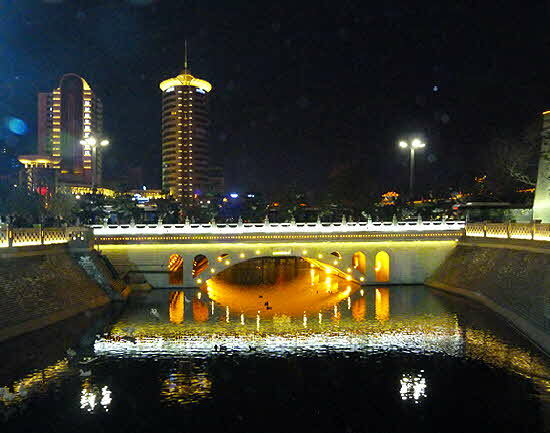 Modern Xi’an is a no-nonsense bustling city of several million people with broad boulevards and functional architecture asserting its way into the 21st century. At the heart of the city is the old town with the ancient wall beautifully maintained, surrounding it. The wall was built during the Sui Dynasty around 582 A.D. with all the defensive trappings of moat (now a park) gate-towers, turrets and guard stations. 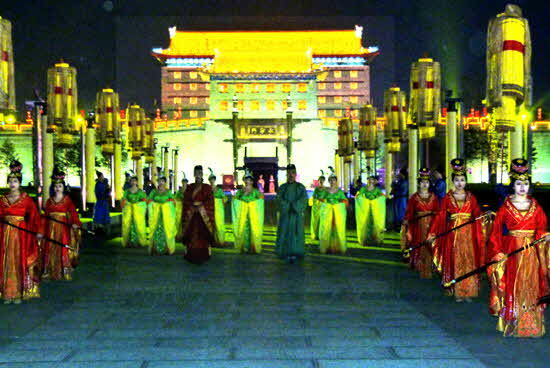 Every night the entire nine-mile wall with its four gate-houses is encircled in lights making for a breathtaking spectacle of light and color. Also lit at night is the ornate Bell Tower which is more or less in the center of the old city with the four major roads -- one emanating from each direction of the four entry gates to the (old) city -- meeting at this junction. The Bell Tower, and its sister the Drum Tower, are also at the center of the city’s activity, surrounded by parks, restaurants, bars, entertainment and people, people, people. An archway under the Drum Tower will get you to the Muslim Quarter, a street filled with vendors selling food and souvenirs, similar to a night market only 24/7. The ancient Silk Road began in Xi’an and Arabic peoples migrated there to do business during the 7th century. The people were called Hui and in 651A.D Emperor Gaozong of the Tang Dynasty officially sanctioned the practice of Islam. The ancestors of the Hui still populate the area with their culture more or less intact. The Muslin Quarter is a foodie’s adventure providing you have a cast-iron constitution. Hygiene does not exist on the street nor does refrigeration so you will see meat lying on a table uncovered while it is being threaded for barbeque; noodles pulled by groups of strong young (unwashed) hands; etc. 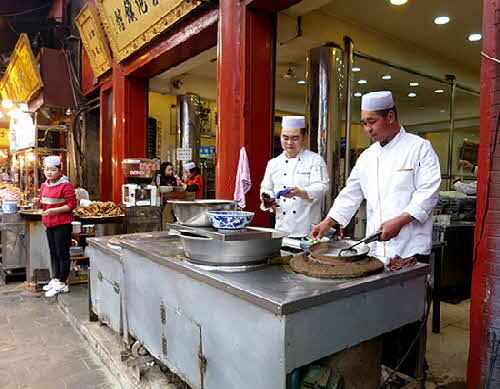 Locals frequent this street and feast on the specialties of buns, soups, noodles, sweets, all prepared in front of you. 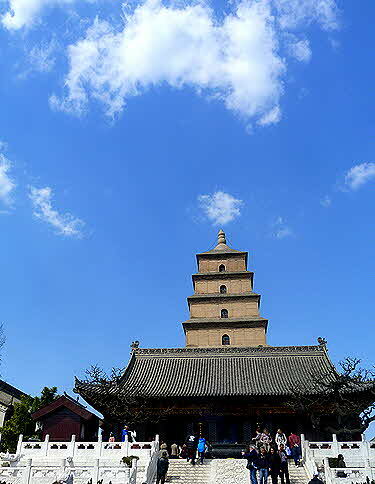 One of the many famous sites in the city is the Tang Dynasty Wild Goose Pagoda. It was built in 652A.D. to store the books and writings of Buddhism brought back from India by Xuan Zang, a Chinese monk. Many stunning works of art are in the temple complex but not to be missed is the story of Buddha, from birth to death, carved out of jade and covering the walls of one building. 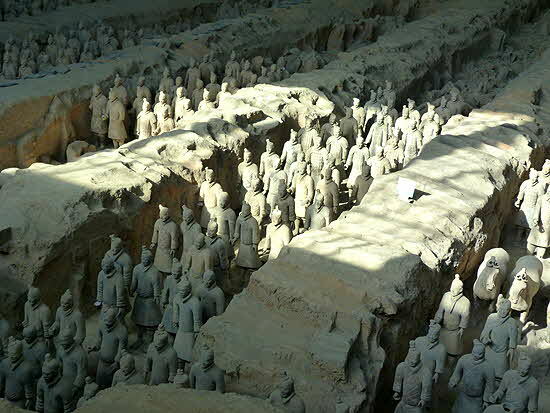 No matter how much you have read or how many pictures you have seen, nothing can prepare you for the actual scope of the excavation of the Terracotta Warriors and the realization that each and every one of the thousands of so-far unearthed figures before you is based on a real individual. You are looking at the faces of people that lived and stood ready to fight to defend their Emperor more that 2,000 years ago. Each figure is different in size, shape, demeanor and grooming; sporting facial hair and hair styles all precisely coiffed in the fashion of the day. Each life-size figure is clothed in a uniform that indicates his fighting function and they stood in poses of fighting preparedness, with weapons in hand. The horses too are well-groomed, strong and alert with ears perked-up ready to hear and respond to the command of their riders. Originally each figure was brightly painted and even after being shattered and in some cases burned (during the unsettled war years of the late Qin Dynasty) and buried for so many hundreds of years, you can still see bits of color that have not peeled off... a testament to the craftsmanship of the workman that labored for years building this fighting force to accompany their Emperor to the hereafter. Even the chariots made out of bronze and led by prancing horses, are exact replicas, decorated with silver and gold details. The Terracotta Army Museum is a complex of three buildings housing the original excavated pits: #1 is the largest and consists of the main army of infantrymen and chariots, #2 chariots, cavalrymen and arches are set in a zigzag formation according to the prevailing directives for the art of war, and #3 contains the command post officers. Shown are examples of the manner in which the figures were originally found plus a workshop where they were and still are, being restored. About 2,000 figures are on display although over 6000 have been so far unearthed. Also on display are many of the ancient weaponry found with the warriors. Of course there is no way to know with certainty the reason the army was created. 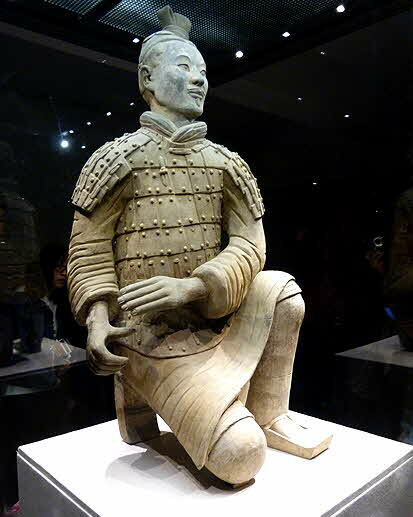 The accepted theory is that the First Emperor Qin Shi Huang 259-210 B.C., commissioned the war machine to accompany him to the afterlife, to insure that he would be victorious in the next world. Although some scholars challenge that theory, time will hopefully reveal the truth. What is known for sure is that as far back as 7,000 B.C., when the dearly departed showed up in dreams of their living loved ones, it was believed they now resided “somewhere else”€�. Over the centuries, this belief led to burying with the dead everything it was deemed they would need in the hereafter. That philosophy could explain the underground city constructed for Qin Shi Huang that purportedly has palaces, temples, a lake of mercury and a sky filled with pearls for stars. 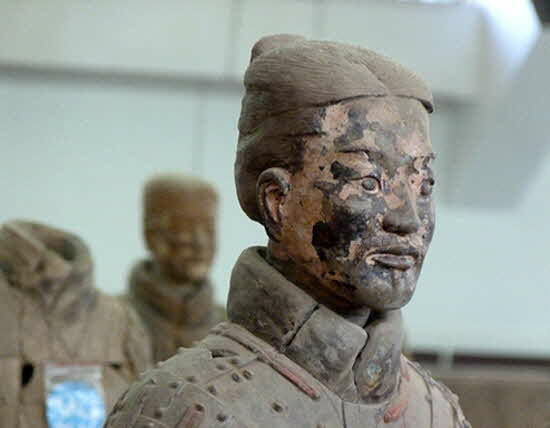 Qin, born Ying Zheng, was the son of the King of Qin, one of the six warring city states. He took the throne at age 13 on his father’s death and by the age of 22 had united the entire country under the Qin Dynasty. So great was his accomplishment that he created the title “First Emperor” to set himself above the Emperors that reined before him. Under his leadership writing, coinage, weights and measures, and a tax system were standardized. He abolished the Feudal System and codified the Law. He also linked the barrier walls that former city-states had built into the Great Wall, providing not only a defensive barricade but also a system of communication and control over those entering or leaving the country, as well as a system of trade and tariffs. By all accounts Qin Shi Huang was a brutal dictator responsible for the deaths of many but he was also a reformer responsible for stabilizing the states into one coherent country. Perhaps it was no surprise that in the end he was driven crazy by his relentless search for the elixir of life. He consumed mercury, that he was convinced would lead to eternal life but instead condemned him to an early grave. Notwithstanding the horrors of his rule, he has left us such a gift in the terracotta soldiers and horsesâ€¦ and who knows what else will be revealed once his tomb is finally opened. One only hopes the tomb will be opened in the foreseeable future. 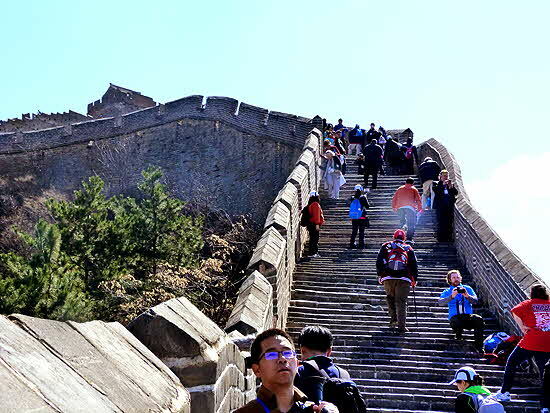 As spectacular as the man-made Terracotta Army is, wait till you see the stairways hewn out of the mountainside at Mt. Huashan. 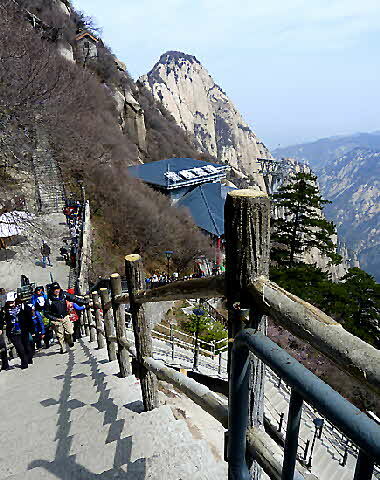 An easy drive out of Xi’an will take you to Hua Shan, the most westerly of the Five Sacred Taoist Mountains. It is one of the most challenging of mountains yet its peeks are ascended by the intrepid faithful by the score. Depending on which peek you choose to climb, the average is about 7,000 feet high. A cable car takes you mid-way up to a platform from which a steep climb will take you the rest of the way to the top. The most torturous climb is the “danger trail” which is a narrow path over a precipice which requires a harness attached to a metal link rope to negotiate. Periodically the rock ledge drops off and a sort of boardwalk was laid by the locals to continue the path. Along the way are temples with significance of myth and mythology. 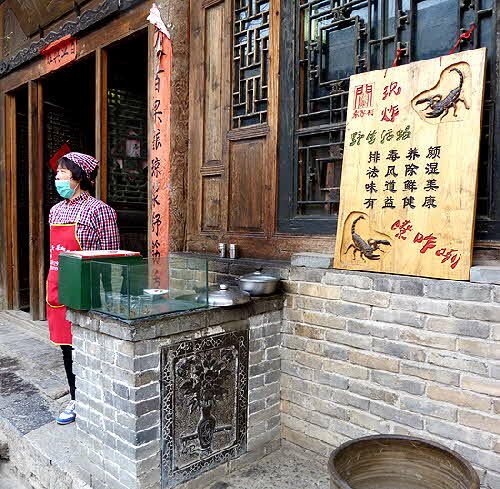 The following day was much more down to earth when we visited Yuanjia Village, called a life experience city, where visitors and locals alike come to enjoy a working village of the China Republic cira 1910 and taste traditional foods such as scorpions captured live and fried to order. Afterwards we visited the Shaanxi History Museum. Shaanxi Provence is considered one of the birthplaces of Chinese culture and this museum is a treasure house for some of the most exquisite examples of painting, china, jade, gold and other precious artifacts from prehistoric times to the present. This not to be missed museum is free but limits entry to 4,000 persons per day and requires a reservation to guarantee entry. A small fee is charged for special exhibitions. Our trip continues to the ancient Silk Road. © June 2016 LuxuryWeb Magazine. All rights reserved.